WASHINGTON — Metro is urging riders who typically use the Blue, Orange or Silver lines not to use the rail system at all for 16 days in August. A 24/7 Blue Line shutdown, coupled with major delays on the Orange and Silver lines due to round-the-clock single-tracking downtown, is scheduled to severely reduce service from Saturday, Aug. 11, through Sunday, Aug. 26. “All Orange, Blue and Silver line customers are encouraged to use alternate transportation and to only use Metro if you have no other option,” Metro said in an advisory to riders. The work overlaps with a six-week 24/7 Red Line shutdown that has Rhode Island Avenue and Brookland stations closed through Labor Day. With school starting in a number of areas, students and teachers may need to find alternative routes, such as buses, biking or long walks. The main focus of the work on the Blue, Orange and Silver lines is to fix the rails, fasteners and other parts of the tracks in the tight curve between McPherson Square and Smithsonian. It is the tightest curve in the rail system, which means the tracks endure extra stress. Crews plan to work on one track at a time, installing rails, fasteners, concrete support pads and other materials. With single-tracking and no additional trains planned along other parts of the Orange or Silver lines, Metro plans to run Orange and Silver Line trains only every 20 minutes each at all times of day, including rush hour. In addition, Metro has decided to shut down the Blue Line through Rosslyn to further reduce the number of trains in the area. There are no shuttle buses planned there. Blue Line trains are only scheduled to run between Franconia-Springfield and Arlington Cemetery for the duration of the shutdown, and are also scheduled to run half as frequently as usual at rush hour. Some “Rush Plus” Yellow Line service will be added between Franconia-Springfield and Greenbelt every 16 minutes at the height of rush hour. On the weekends of Aug. 11-12 and Aug. 25-26, the single-tracking zone downtown will instead be turned into a complete shutdown that closes Farragut West, McPherson Square and the Blue, Orange and Silver Line platform at Metro Center. For the entire shutdown, Metro will not provide refunds to significantly delayed rush-hour riders with registered SmarTrip cards. While Blue Line riders to and from Virginia stations are the only ones who face a complete shutdown, they may also have the clearest alternatives. To and from stations south of Pentagon, the best bets could be Virginia Railway Express commuter rail at rush hour or crowded Yellow Line trains at all times the Metro system is open. VRE’s Fredericksburg Line stops at Woodbridge, Lorton, Franconia-Springfield, Alexandria (next to the King Street Metro stop), Crystal City, L’Enfant Plaza and Union Station. The Manassas Line runs through Burke Centre, Rolling Road, Backlick Road, Alexandria, Crystal City, L’Enfant Plaza and Union Station. Commuter and other bus routes to Pentagon and Crystal City can also provide direct connections to get around some of the Metro work and expected additional traffic jams. To and from Rosslyn, a number of Metrobus, ART or DC Circulator routes could provide alternatives, along with the numerous commuter buses that serve Rosslyn from places like Loudoun and Prince William counties. Metro recently cut some regular bus service to Rosslyn in June with the end of the 10E, so that is no longer an option, but Metrobuses 23A and 23B between Ballston and Crystal City could assist riders who usually use Rosslyn as a transfer point. Arlington’s ART 42 also runs from Ballston to Virginia Square, Clarendon and Pentagon. There are also a number of buses that stop at Pentagon that could work as a backup to rail service in and out of the District if there are any problems on the Yellow Line. Biking or walking along the variety of trails in the area to connect to other buses or trains is probably a good option as well if weather allows. Regular Metrobus routes cost $2. Circulator fares are $1. Each are covered by the $17.50 weekly regional bus pass. Express buses cost $4.25. Commuter bus fares vary by agency, and commuter rail fares vary based on distance. For most Orange and Silver Line rush-hour riders in Virginia, commuter or regular bus routes or the VRE Manassas Line may be the best bet to avoid the major Metro delays and likely additional traffic. In Loudoun and Prince William counties, a number of commuter bus routes run to Pentagon, Rosslyn and the District. In Farifax County, several rush-hour express bus routes run inside the Beltway, including the new Fairfax Connector Route 699 to Foggy Bottom from the Fairfax County Government Center and Route 599 from Reston North Park and Ride to Pentagon, Pentagon City and Crystal City. Just days before the shutdown, Fairfax Connector announced it would add rush-hour buses between Vienna and Pentagon as it did during previous round-the-clock track work that impacted the Orange and Silver Lines. The buses are only scheduled to run toward the Pentagon in the morning and back in the afternoon, and will only run during weekday rush hours. Fairfax Connector said parking at Vienna Metro would be free for the riders. In the morning, the first bus is scheduled to leave at 5:40 a.m. and the last departs at 8:40 a.m. In the afternoon, the first bus departs Pentagon at 3:20 p.m. and the last departs Pentagon at 6:40 p.m. The express buses cost $4.25 each way. Fairfax Connector plans similar special express service between Reston South Park & Ride and Pentagon during weekday rush hours. The fare for that route will be $7.50 each way with buses toward the Pentagon between 5:25 a.m. and 8:25 a.m. and toward Reston between 3:35 p.m. and 6:35 p.m.
Another option for riders is the Metrobus 5A Dulles Airport line ($7.50 each way), which also runs express between Herndon-Monroe Park and Ride, Rosslyn and L’Enfant Plaza. In Arlington, Metrobus Route 38B can be crowded, but it runs regularly roughly along the Orange and Silver Line route between Ballston, Rosslyn, Georgetown, Foggy Bottom and Farragut Square. Riders in some areas who typically drive to Orange or Silver Line stops may also be able to drive to Yellow Line stations instead. Metro suggests not parking at the Vienna, Dunn Loring, West Falls Church, East Falls Church or Wiehle-Reston East stations during the work. The waits for trains will be so lengthy, and trains could be extremely crowded, especially in the first days of the work. For riders to and from Maryland, the best alternatives are likely regular or MTA commuter bus routes or MARC trains. While there are few additional transportation options being provided across the region during this shutdown beyond normally scheduled service, MARC will allow Penn Line riders with weekly and monthly passes to and from New Carrollton to board or get off at Union Station for no additional cost during this Metro work zone. The exemption does not apply to one-way tickets, which still must list the proper origin and destination stations. MARC’s Penn Line runs through Bowie State, Seabrook, New Carrollton and Union Station. MARC’s Camden Line stops at Laurel, Muirkirk, Greenbelt, College Park, Riverdale and Union Station. Riders who typically drive to Metro stations could also consider driving to Green Line stops instead. Within Maryland, several bus routes connect the Largo Town Center, Morgan Boulevard and Addison Road stations. At Addison Road, several bus routes also run to Capitol Heights for other transfers or to Naylor Road and Suitland to reach the Green Line. Along the Orange Line, Metrobus F12 connects New Carrollton, Landover and Cheverly. Route T18 also runs between Rhode Island Avenue and New Carrollton (although the Rhode Island Avenue station is closed on the Red Line). From Landover, Route A12 connects to Addison Road and Capitol Heights for riders who otherwise would take that trip on the rails. The workarounds: Orange, Silver and Blue Line stops in D.C. Within the District, some combination of biking, walking, regular bus routes and the Yellow or Green lines will often be the best bet. Riders on Yellow, Green or Red Line trains should avoid transferring to Orange and Silver Line trains in most cases. L’Enfant Plaza, Archives and Gallery Place are relatively close to Smithsonian, Federal Triangle and Federal Center SW. Metro Center, Farragut North and Dupont Circle are also not far from Foggy Bottom, Farragut West, McPherson Square and Federal Triangle, depending on your exact destination. Downtown, Metro’s 30N, 30S, 31, 32 and 33 bus routes run along Pennsylvania and Wisconsin avenues across the city. At rush hour, the 37 in Northwest and 39 in Southeast provide limited-stop service along similar routes. DC Circulator service could also be an option, with routes between Rosslyn and Dupont Circle; the Glover Park area, K Street and Union Station; McPherson Square to Columbia Heights and Woodley Park; Eastern Market to Navy Yard, Waterfront and L’Enfant Plaza; and Congress Heights to Eastern Market and Union Station. On the east side of the city, the rush-hour X1 (Minnesota Avenue-Union Station-Federal Triangle-Foggy Bottom) and the X9 limited-stop (Minnesota Avenue-Gallery Place-Metro Center-Capitol Heights) buses provide alternatives to some Blue, Orange and Silver Line service. The X2 down H Street Northeast is also an option. Within Northeast, several bus routes connect to those buses at Minnesota Avenue and link the station to the Capitol Heights, Navy Yard and Anacostia stations. Several buses also run past Benning Road. Metrobus routes 96 and 97 also overlap with the Blue and Silver Line tracks between Capitol Heights and Stadium-Armory before turning toward Union Station, U Street, Woodley Park and Tenleytown. As noted above, the work zone expands to a shutdown Aug. 11-12 and Aug. 25-26, with no trains between Foggy Bottom and Federal Triangle. The Farragut West and McPherson Square stations will be closed, and Metro Center will only have Red Line service. On those weekends only, Metro plans shuttle buses between Foggy Bottom and Federal Triangle. The weekend of Aug. 18-19, Orange and Silver Line trains are scheduled to be single-tracking in the same way as on weekdays, with no shuttle buses available and no Blue Line trains through Rosslyn. After this shutdown and single-tracking ends, the ongoing Red Line shutdown continues. The Rhode Island Avenue and Brookland stations remain closed through Labor Day. During that shutdown, the last inbound Red Line trains from Glenmont to Fort Totten depart each night 30 minutes earlier than usual. After that shutdown ends Sept. 3, the next 24/7 work zones are planned on the Blue and Yellow lines. From Friday, Nov. 2, through Monday, Nov. 5, Metro plans to shut down the Blue and Yellow lines through Reagan National Airport. The airport station and Crystal City will be closed, with shuttle buses running between Braddock Road and Pentagon City. 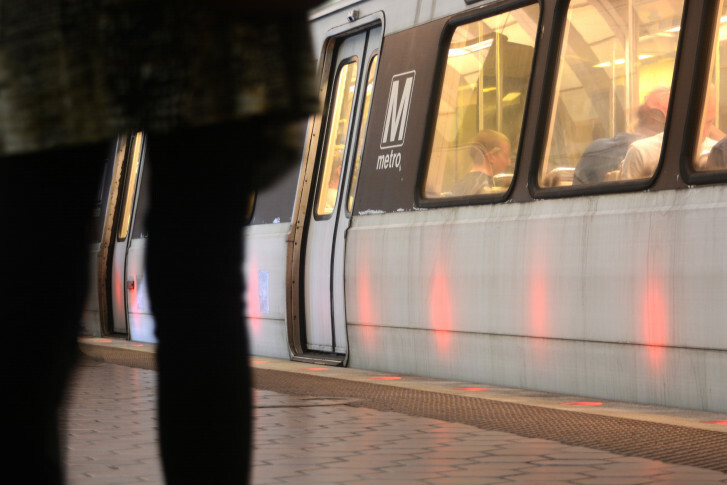 Then, for the two weeks following Thanksgiving weekend, Metro plans to shut down the Yellow Line in and out of the District. From Monday, Nov. 26, through Sunday, Dec. 9, the Yellow Line bridge over the Potomac will be closed for major repairs. Yellow Line trains are scheduled to only run between Huntington and Reagan National Airport. Next summer, Metro plans to shut down the entire Blue and Yellow lines south of Reagan National Airport from Memorial Day to Labor Day for platform repairs.